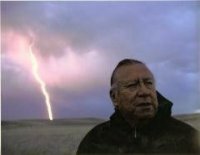 A respected elder, Leonard Little Finger is well known for his Lakota expertise and promotion of Native American rights. He is the Founder/Director of a private Lakota language school, Sacred Hoop School, teaching in total immersion methodology. The school is dedicated …to his grandfather, a survivor of the Wounded Knee Creek Massacre of 1890. He also operates a Lakota Culture Camp and Tours, Lakota Journey, that offers culture work shops and tours for all ages, including school camps. He served as a Cultural Resource Specialist at Loneman School in Oglala, for 11 years. Under his leadership, the Lakota Studies program developed into one the most progressive Indian Studies program in Indian country. Prior to this position, Little Finger was the CEO of the Pine Ridge Indian Health Service Hospital, retiring after 28 years of service for the people of the Pine Ridge Indian Reservation. Education Association, and served as President of the Red Cloud Indian School Board. Little Finger is a recognized public speaker. He has been twice a representative and presenter to the United Nations Draft Declaration for the rights of Indigenous Peoples in Geneva, Switzerland. He also spoken at Bundestag (German Parliament) in Bonn, Germany; and, at the World Parks Conference in Durbin, South Africa. In addition to appearing in several film documentaries and national radio shows, Little Finger authored the book, Lightning and Thunder Spoke to Me, an account of the repatriation of a hairlock belonging to his great-great grandfather, Sitanka, leader of the Mniconjou Band massacred at Wounded Knee Creek in 1890. He currently resides in Oglala, SD., semi-retired, continuing his work to elevate through speaking and writings of an understanding of the culture, history, spiritual beliefs, language and inherent rights of the Lakota, The People of the Seven Council Fires, Oceti Sakowin Oyate. On May 7, 2011, Leonard was awarded an Honorary Doctorate from the College of Mount St. Joseph, Cincinnati, Ohio. In addition, he delivered the commencement address for 500 graduates. He was recognized for the many years of work in promoting the Lakota language and culture to Lakota youth, and for articulating the Lakota Mores to people throughout the world. Beginning in the first part of 2012, free Lakota language lessons will be offered on the internet at http://www.lakotacirclevillage.org . This program will provide an understanding of Lakota Ta”Woyukcun, or Lakota Thought. This entry was posted in Make No Bones Shows and tagged Big Foot, Connecting with Spirit, Council of Language Elders, Honoring, Human Rights, Indigenous, KAOS 89.3 FM, Lakota Circle Village, Lakota Culture, Lakota Language, Leonard Little Finger, Make No Bones About It, Raven Redbone, Wounded Knee Healing Prayer, Wounded Knee Massacre. Bookmark the permalink.